Background and Objective: Iridaceae is a widespread family which include 92 genus and 6 of them are spreading in Turkey. This family includes wild plants whose endemic species have attractive flowers. Iris sari is a folk medicinal plant in Southeastern of Turkey. This study aimed to investigate the biological and bioactive properties of I. sari in Turkey. Materials and Methods: In this study, n-hexane, dicloromethane, methanol and water extracts from different parts (flower, leaf and rhizome) of I. sari were obtained by Soxhlet apparatus and their antioxidant, antibacterial and DNA protection activities were studied. Antioxidant activity, total antioxidant and oxidant levels were determined by using Relassay Diagnostics Kit (Antioxidant Kit, Turkey) and DPPH assay was used to determine antibacterial activity. Microdilution assay was conducted by using 9 different bacterial strains (S. aureus ATCC 25923, P. aeruginosa ATCC 27853, K. pneumoniae ATCC 700603, S. aureus ATCC 29213, E. coli ATCC 25322, E. coli ATCC 35218, E. coli ATCC 10799, E. coli ATCC 8739 and S. aureus ATCC 6538) according to CSL. To determine DNA protection activity, pBR322 plasmid DNA assay were used. Results: Results showed that water and methanol extracts of I. sari showed high antioxidant activities in both antioxidant methods. Although the highest antioxidant and antibacterial activities were found in root water extract, the most DNA protection effect was found in water and methanol extracts isolated from leaf and flower. Conclusion: It was concluded that the endemic and medicinal plant; I. sari contain active metabolites which are responsible for these antioxidant, antibacterial and DNA protection activities. Safwan Moaket, Sibel Bayil Oguzkan, Ibrahim Halil Kilic, Bedrettin Selvi, Isik Didem Karagoz, Mehmet Erdem, Nese Erdogan, Huseyin Tekin and Mehmet Ozaslan, 2017. Biological Activity of Iris sari Schott ex Baker in Turkey. Journal of Biological Sciences, 17: 136-141. Iridaceae is a widespread family in Europe, America, Northern Asia, tropical regions of Africa and Australia. The number of determined species in this family is around 92. In Turkeys flora, there are 6 species. These species are as the followings; Romulea, Crocus, Gynandriris, Hermodactylus, Gladiolus and Iris1,2. Iris sari Schott ex Baker is an annual herbaceous plant and it is around 10-30 cm tall. The flowers are vascular red or yellowish, brown-purple on balm or greenish base, some of them are bluish purple as standard (Fig. 1). Dry, sandy hills and rocky mountainsides with 900-2700 m height are the places where Iris sari Schott ex Baker grows. It blooms in April-June. It grows in terrestrial and Southeastern regions of Turkey3,4. There are many studies about different species of Iridaceae family; especially about I. germenica5,6. Many studies were conducted about I. nigricans, I. sibirica, I. carhaliniae, I. bungei, I. pseudopumila, I. spuria and I. junonia species and their biological activities5,6. Rhizome of the I. germanica was studied in terms of antibacterial, antifungal, insecticidal and phytotoxic activities7. There has not been any study about the biological activities of Iris sari, yet. Recently, the interests of scientists about potential herbals (natural plants) which have protective or remedial effects against illness and the related scientific studies have increased gradually. The consumed oxygen during catabolism in living systems can turn into various high radicals. The most significant target of molecules known as reactive oxygen species is on carcinogenesis. Unrecoverable DNA damages can cause carcinogenesis, aging and other degenerative illness8. Besides, the organism has enzymatic and non-enzymatic anti-oxidant defense systems that participate during the inactivation of free radicals. Most of the natural products have various anti-oxidants9. Diet factors and natural anti-oxidants and especially plants can prevent DNA damage by reducing the amount of reactive oxygen species therefore they decrease the cancer risk10,11. In this study, both DNA protective activities and oxidant-antioxidant incidents of extracts were assessed which were prepared at suitable optimization. Kandemir12 investigated antineoplastic, antioxidant, antitumor, anti-plasmodia, anti-tuberculosis and di-uretic effects of rhizomes of Iris13. Rigano et al.14 showed that isoflavones in rhizomes of I. preudopumila have high antioxidant activities12. The aim of this study was to investigate the antioxidant, DNA protective activities and antibacterial effects of root, leaf and flower parts of I. sari (an endemic species of Iris genus) in four various extractors. It was also aimed to provide the conscious usage of plants and prior knowledge to pharmacologic studies in accordance with the determination of biological activities of I. sari. Iris sari extraction: The following materials were used for the extraction; dichloromethane (CH2Cl2) (Sigma Aldrich, Germany), methanol (CH3OH) (Sigma Aldrich, Germany), hexane (C6H14) (Sigma Aldrich, Germany), distilled water (dH2O), Soxhlet (Gerhardt EV 14) and evaporator (Heildolph Heizbad HB Digit). The dry root, flower and leaf parts of the plant were pulverized with a smasher. By Soxhlet method, dichloromethane, methanol, hexane and water were extracted from each part (root, flower, leaf) of I. sari. Dichloromethane, methanol and hexane were evaporated by rotary evaporator. The extractions were stored at +4°C until the experiment started. Determination of antioxidant activity: The free radical removal capacity of the extracts was determined by using the free radicals of the 1,1-diphenyl-2-picrylhydrazyl (DPPH)15. The DPPH solution which was added to the extracts caused a decrease in the absorbance value of the optical density and the lightening of the colors of extracts showed that the extracts were radical scavengers. Determination of total antioxidant activity with ABTS method: Commercially sold kits were used in order to determine the antioxidant capacity of the extracts obtained from the root, flower and leaf of the I. sari. The antioxidant agents of the sample turn the dark blue-green colored ABTS into a radical reduced ABTS and the change in the absorbance at the 600 nm determines the antioxidant level of the sample. The ABTS [2,2 azino bis (3-ethyl benzo thiazoline-6-sulfonic acid] was used as radical while synthetic antioxidant and Trolox which is the analogue of vitamin E were used as positive control16. Real Assay Diagnostics-TAA Assay Kit was used in the study. Determination of total oxidant level and the antioxidant activity: This test is calibrated with hydrogen peroxide. In the presence of oxygen, the ferrous ion oxidizes the chelate complex into ferric ion. The density of the oxidation reaction increases depending on the presence of the oxygen within the environment of the reaction. The ferric ion forms a colored complex in acidic environment. 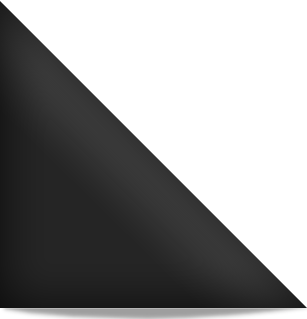 The color intensity is measured spectrophotometrically. The absorbance value indicates the oxidant value in the example. The total oxidant level value was detected by comparing the obtained results with H2O2 Equiv (μmol L1)17. Vitamin C was used as a control. Antibacterial activity of I. sari: For the antibacterial activity of root, flower and leaf extracts of I. sari, the following 9 different standard bacterial strains were used: Staphylococcus aureus ATCC 25923, Pseudomonas aeruginosa ATCC 27853, Klebsiella pneumoniae ATCC 700603, Staphylococcus aureus ATCC 29213, Escherichia coli ATCC 25322, Escherichia coli ATCC 35218, Escherichia coli ATCC 10799, Escherichia coli ATCC 8739 and Staphylococcus aureus ATCC 6538. 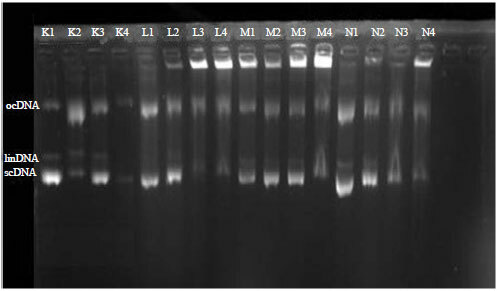 In order to determine the MIC values of the I. sari extracts, the CLS was performed for 3 times repeatedly with the microdilution method according to the guidelines18. The growth of the bacteria was observed in the presence of a white pellet or dimness. DNA protective activity of I. sari: The DNA of the pBR322 plasmid was used to detect the effects of the extracts to protect the DNA from the UV and oxidative induced damages. The DNA of the plasmid was subjected to damage in the presence of the extracts by applying H2O2 and UV. The visualization was performed on 1.25% agarose gel. For the DNA protective activity test 0.1 mg was weighed from the extracts of the I. sari root, flower and leaf to prepare 0.1% stock concentration and it was dissolved in 100 μL DMSO (dimethyl sulfoxide, 10%). After ensuring the full dissolution of the extracts, the 0.1% I. sari root, flower and leaf extracts solutions were diluted in 1/5 ratio. Approximately 40 μL dH2O was added on 10 μL extract and this ratio was used in the study19. 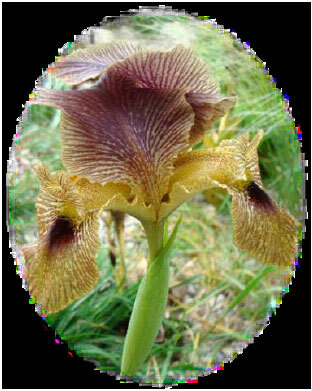 Iris sari Schott ex Baker is an endemic plant and studies have not been revealed yet regarding its bioactive features. Therefore, in this study the biological activities of the I. sari root, flower and leaf parts were determined in dichloromethane, methanol, water and hexane solvents. The free radical remover effects of the plant extracts used in this study were tested on DPPH which is stable radical. In four extracts derived from the I. sari, the removing success of the DPPH from the environment has increased with the increase in the concentration in direct proportion. The Oxidative Stress Index (OSI) values of these four different extracts were determined by measuring the Total Antioxidant Levels (TAL) and Total Oxidant Levels (TOL). In Table 1, the low levels of the OSI values showed that the oxidant activity was rather low and it was detected that the dichloromethane, methanol and water extracts were good antioxidants but only the hexane extract did not demonstrate oxidant activity. Rigano et al.14determined that the isoflavones isolated from the rhizomes of I. pseudopumila showed high antioxidant activity. So, these results were correlated with the other Iris genus result. Table 2 and 3 show the reference values of total antioxidant and oxidant levels. In this study, the inhibition effects of 4 different extracts obtained from the I. sari were investigated against 9 different bacteria by using the microdilution-broth method (Table 4). The extracts obtained from the plant used in the study are thought to have wide-spectrum antibacterial effects against the used bacteria. Further pharmacologic researches are needed in order to use these extracts having antimicrobial activity as medicaments for the treatment of the diseases caused by pathogen microorganisms. The antibacterial results of this study have a preliminary nature for the identification of the extracts determinant compounds and for using these compounds as drug or medicine. The DNA of the pBR322 plasmid demonstrated two bands in the agarose gel electrophoresis. These are the fast walking supercoiled DNA (scDNA; super stranded DNA; without fracture) which are the natural form of the plasmid and the slow walking open circular DNA (ocDNA; DNA containing a single fracture in the chain). The exposure of the DNA to UV radiation in the presence of H2O2 caused fracture in the open-circular DNA and the emergence of the linear DNA (lin DNA; include one or more fractures in the two chains)20. The results of the DNA protective activity showed linear DNA bands occurred in none of the extracts derived from the I. sari root, flower and leaf as shown in Fig. 2. In other words the water and methanol extracts were found to be protective against the damaging effects of UV and H2O2 to the DNA. It is reported that phenyl propenyls, flavonoids, dihydroflavonols and glycozides are very common in Iris species. The roses of Iris species also abundant with anthocyanins. A glican flavonoids, xanthan iso-flavonoids and phenolics were also isolated from roots, flavor and rhizomes of Iris species21. Thus supported the present results that I. sari is one of the good anti microbial agent. Moreover, anti bacterial, antifungal, insecticidal and phytotoxic activities of plants sap extracted from I. germanica were reported by Orhan et al.7. The extracts of rhizomes of the Iris species have been reproted as antineoplastic, antioxidant, antitumoral, antiplasmodical, antituberculative, antispazmodic and diuretic effects of Iris sap by Kandemir12. On the other hand, a parralel work with present study was carried out by Rigano et al.14. In that study, iso-flavonoids isolated fromthe rhizomes of I. pseudopumila had a high antioxidant activity. It has been reported that there are alot of bioactive substans and the potentially important compounds in the sap of many species in Iris genus21. Kassak21 worked on the phenolic and flavonoidal content of five Iris species (Iris pseudacorus, I. crocea, I. spuria, I. orientalis and I. ensata). Fresh dryed rrhizomes were exctracted and the maximum total flavonoids and maximal flavonoids were determined in Iris pseudacoru. While there are many studies related especially to I. germenica from the Iridaceae family. Studies have been also conducted on the biological activities of the following species; I. nigricans, I. sibirica, I. carhaliniae, I. bungei, I. pseudopumila, I. spuria and I. junonia20,22. In a study conducted by Uzun et al.23 the effects of growth factor of the plant tissue cultures were investigated in vitro in the immature embrios of I. sari and I. schachti24. However, any research was not revealed about I. sari in terms of its biological activity. Iris sari was thought to have lot of bioactive compounds due to the fact that the other Iris species contain bioactive compounds and the rhizomes are used in the treatment of various diseases such as tuberculosis and plasmodia diseases among the people. The further investigations are needed for using this plant to some industrial areas such as drug or cosmetic. Anonymous, 2014. TBVES Iris junonia. Erisim Tarihi, May 23, 2014. http://tubives.com/index.php?sayfa=1&tax_id=9338. Atta-ur-Rahman, S. Nasim, I. Baig, S. Jalil, I. Orhan, B. Sener and M. Choudhary, 2003. Anti-inflammatory isoflavonoids from the rhizomes of Iris germanica. J. Ethnopharmacol., 86: 177-180. Choudhary, M.I., M. Nur-e-Alam, I. Baig, F. Akhtar and A.M. Khan et al., 2001. Four new flavones and a new isoflavone from Iris bungei. J. Natural Prod., 64: 857-860. Davis, P.H., 1984. Flora of Turkey and the East Aegean Islands. Vol. 8, Edinburgh University Press, Edinburgh, pp: 358-445. Farag, S.F., E.Y. Backheet, N.A. El-Emary and M. Niwa, 1999. Isoflavonoids and flavone glycosides from rhizomes of Iris carthaliniae. Phytochemistry, 50: 1407-1410. Halliwell, B., 2012. Free radicals and antioxidants: updating a personal view. Nutr. Rev., 70: 257-265. Hatano, T., H. Kagawa, T. Yasuhara and T. Okuda, 1988. Two new flavonoids and other constituents in licorice root: Their relative astringency and radical scavenging effects. Chem. Pharm. Bull., 36: 2090-2097. Kandemir, N., 2006. An investigation on the autecological of endemic Iris taochia woronow Ex grossh. (Iridaceae) distributed in the North East Anatolia region. Pak. J. Biol. Sci., 9: 2753-2760. Kassak, P., 2013. Total flavonoids and phenolics content of the chosen genus Iris species. Acta Univ. Agric. Silviculturae Mendelianae Brun., 60: 119-126. Ke, Y., X. Duan, F. Wen, X. Xu and G. Tao et al, 2010. Association of melamine exposure with urinary stone and oxidative DNA damage in infants. Arch. Toxicol., 84: 301-307. Khan, N. and S. Sultana, 2005. Inhibition of potassium bromate-induced renal oxidative stress and hyperproliferative response by Nymphaea alba in Wistar rats. J. Enzyme Inhib. Med. Chem., 20: 275-283. Larson, R.A., 1988. The antioxidants of higher plants. Phytochemistry, 27: 969-978. Marner, F.J., W. Krick, B. Gellrich, L. Jaenicke and W. Winter, 1982. Irigermanal and iridogermanal: Two new triterpenoids from rhizomes of Iris germanica L. J. Org. Chem., 47: 2531-2536. Mathew, B., 1984. Crocus L. In: Flora of Turkey and the East Aegean Islands, Davis, P.H. (Ed.). Vol. 8, Edinburgh University Press, Edinburgh, pp: 413. Orhan, I., S. Nasim, B. Tener, F. Ayanoglu, M. Ozguven and M.I. Choudhary, 2003. Two isoﬂavones and bioactivity spectrum of the crude extracts of Iris germanica rhizomes. Phytother. Res., 17: 575-577. Osbourn, A.E., 1996. Preformed antimicrobial compounds and plant defense against fungal attack. Plant Cell, 8: 1821-1831. Reller, L.B., M. Weinstein, J.H. Jorgensen and M.J. Ferraro, 2009. Antimicrobial susceptibility testing: A review of general principles and contemporary practices. Clin. Infect. Dis., 49: 1749-1755. Rigano, D., C. Formisano, A. Grassia, G. Grassia and A. Perrone et al., 2007. Antioxidant flavonoids and isoflavonoids from rhizomes of Iris pseudopumila. Planta Med., 73: 93-96. Taiz, L. and E. Zeiger, 2008. Bitki Fizyolojisi-Ucuncu Baskidan Ceviri. Palme Yayincilik, Ankara, pp: 283-308. Tarpey, M.M., D.A. Wink and M.B. Grisham, 2004. Methods for detection of reactive metabolites of oxygen and nitrogen: In vitro and in vivo considerations. Am. J. Physiol. Regulat. Integrat. Comparat. Physiol., 286: R431-R444. Tepe, B., S. Degerli, S. Arslan, E. Malatyali and C. Sarikurkcu, 2011. Determination of chemical profile, antioxidant, DNA damage protection and antiamoebic activities of Teucrium polium and Stachys iberica. Fitoterapia, 82: 237-246. Topcu, G., M. Ay, A. Bilici, C. Sarikurkcu, M. Ozturk and A. Ulubelen, 2007. A new flavone from antioxidant extracts of Pistacia terebinthus. Food Chem., 103: 816-822. Usta, E., 2002. Assessment of the present taxonomic status of Turkish Iris L. (Iridaceae) by phenetic methods. Ph.D. Thesis, The Middle East Technical University. Uzun, S., A.I. Ilbas, A. Ipek, N. Arslan and S. Barpete, 2014. Efficient in vitro plant regeneration from immature embryos of endemic Iris sari and I. schachtii. Turk. J. Agric. For., 38: 348-353.